The ship is a solidly built workhorse, well-suited to its target market. Content in its own reinforced and well-seasoned skin, Marco Polo's sense of comfortable familiarity harks back to an earlier age of cruising and gives the ship a homely feel. It should be noted that the team who set itineraries and fares for Marco Polo are equally clear as to the ship's identity and appeal. Cruise & Maritime's marketing apparatus provides no end of competitively-priced offers for a clientele who appreciate the convenience of departing from Tilbury -- at the mouth of the Thames watershed where the ship is based -- and the ease and security that come with knowing a holiday won't break the bank. A ‘child-free' ship (as CMV describes Marco Polo on its website), Marco Polo has a pleasingly mature ambience. And of course for those with an aversion to the mass-market mayhem of larger cruise ships, there is the pleasure of being on a ship that seems sized for the convenience of passengers rather than the corporate bottom line. Embarkation, disembarkation and tendering are relatively easy processes, particularly when compared to some larger ships, on which getting on or off the ship in port can take hours. Another breath of fresh air is the relative lack of pressure for onboard revenue, and while art auctions are present, they are discreet, well-organised and uncluttered. Though photographers are there, they ask if you want your photo taken rather than demanding it -- and if you say no, they're perfectly fine with that. The same goes for bar staff -- there if you want them, but never pressuring you to buy a novelty cocktail glass, for example. 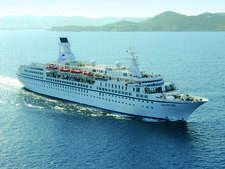 Marco Polo began life in 1965 as the Alexander Pushkin. The second of five East German-built ships named after famous Russian writers and collectively known as the "Five Poets", it was one of the largest, fastest and most prestigious ocean liners in the Soviet merchant fleet -- then the world's largest. The Pushkin was given to the Leningrad-based Baltic Sea Shipping Company for seasonal trans-Atlantic service between Leningrad and Montreal. 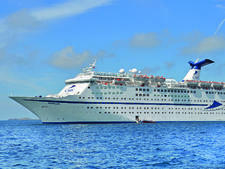 The rest of the year, the ship would operate on cruises, both to ports like Havana for the domestic market as well as to other ports around the world on charter with Western tour companies. By the mid-1970's the vessel had switched to full-time cruising. Though far from luxurious -- the public areas were decorated in a typically grim Soviet style, and most cabins were tiny and without private bathrooms -- the Pushkin and other large Soviet cruise ships became increasingly popular in Western markets as budget-priced cruise ships. With the U.K., West Germany and Australia providing most of the passengers, the Five Poets became important sources of hard currency for the Soviet economy, which had begun to stagnate in the 1970's. In the 1980's, however, the ship was transferred to the Far Eastern Shipping Company of Vladivostok, and began cruising from Australia. In 1990 the Australian career of the aging Alexander Pushkin -- 25 years old by that point -- came to an end, and the ship was laid up in Singapore. Many expected it to go for scrap. Instead, the next year Gerry Herrod, the British entrepreneur who had earlier founded Ocean Cruise Lines, purchased the ship. The Alexander Pushkin was taken to Greece where, two years and millions of dollars later, it emerged as Marco Polo, the first ship of Herrod's new company, Orient Lines. During its refurbishment, Marco Polo was stripped down to the bare steel, and aside from the hull and engines, nothing from the old Soviet era was saved. 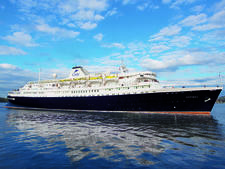 Under the skillful guidance of Danish naval architects Knud E. Hansen A/S and the Greek interior designers of AMK Interiors, the Marco Polo was transformed from a rusting Soviet-era relic into a practically new ship. The ship's sleek external lines were retained -- even improved -- while inside all the latest amenities of early 1990's cruising were added, packaged in a sleek neo-Art Deco style. Herrod's extensive overhaul combined with the ship's original utilitarian design has served to prolong the ship's life and to make it something of a time capsule in which the evolution of cruising over the past 45 years can be traced. Marco Polo's back story is palpable onboard and will be of particular appeal to ship buffs and historians. 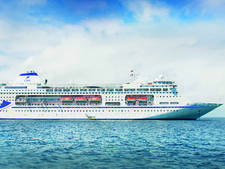 Marco Polo became part of the fleet of Cruise & Maritime Voyages, one of the U.K.'s youngest cruise lines, in 2010. Its ex-U.K. cruises feature a wide variety of itineraries, from the Norwegian fjords to the Amazon, the Canaries to the Mediterranean. Put simply, Marco Polo is about the basics of cruising: going to interesting places in comfortably well-worn surroundings in the company of your peers. In this day and age, where every ship seems to be a gleaming new mega-liner or an ultra-luxury "yacht" with fares so high they make your eyes water, the number of ships that can offer this kind of cosy and familiar feel at this price point is shrinking fast. In short, Marco Polo is a superb choice for anyone wanting a traditionally British, adult-only cruise experience aboard a real ocean liner at a reasonable price, and without an ounce of flash or pretence. Under its current ownership, the demographics for passengers aboard the Marco Polo skew heavily towards those from the U.K. The ship does not appeal to many families, though couples and singles of a wide range of ages do travel onboard. The average age is around 60. With the types of prices on offer for a Marco Polo cruise, passengers are fairly evenly divided between repeat passengers and experienced cruisers who are cruising based on convenience and economy. 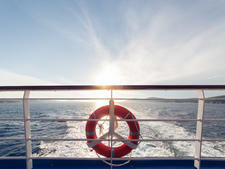 New-to-cruise passengers are quite welcome and will find themselves amongst an easygoing and familiar crowd. During the day, dress is casual but never sloppy; pool wear is seen around the pool but nowhere else. Despite the categories of informal, casual and formal, at night, the ship adheres to a more traditional smart casual, semi-formal and formal definitions: Informal is largely ignored in the evenings, and even casual means "smart casual" with T-shirts, shorts and jeans frowned upon. General attire is a suit or jacket with or without tie for men, and cocktail dress, skirt or pantsuit for women; formal nights mean a tuxedo/dinner jacket or dark suit and tie for men, and formal dress for women, though the formal category is “suggested” and not overly enforced. Dress code compliance is universal; this is not a ship for those who refuse to dress up. Gratuities of &pound;7 per person, per night, are automatically charged to passengers' onboard accounts. 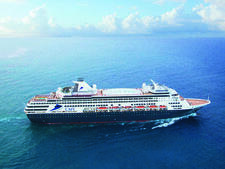 For cruises lasting more than 16 nights, the gratuity is &pound;6 per person, per night. Astor is higher-end than CMV's other two ships -- Marco Polo and mv Discovery -- and gratuities and all dining (including the specialty restaurants) are included.